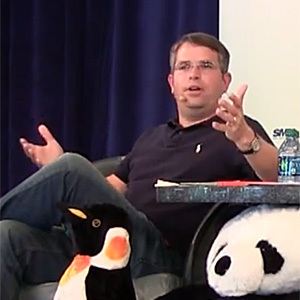 Matt Cutts, head of Google Web Spam team, held one of the popular and engaging “You&A Keynotes” at SMX Advanced Seattle 2014 in which he addressed and answered questions from the SMX Advanced audience. This video highlights in 20 minutes the most important news about upcoming updates of Google Search and answers about common and more uncommon questions SEOs worldwide have to tackle. Follow OMReport on Facebook, Twitter or as RSS to get the latest interviews fast. This interview is also available on iTunes and on Youtube. This entry was posted in Online Marketing Podcast. Bookmark the permalink.